The Green Bay Packers head into this Sunday’s NFC Championship game against the Bears as big favourites – and rightly so. The Packers are 1/2 in the betting to make it to the Super Bowl next month and – despite the sides winning one game each in their two meetings this term – it’s hard to see beyond the Packers. Quarterback Aaron Rodgers has enjoyed a brilliant season and was instrumental in the Packers 48-21 demolition in their last game, throwing three touchdowns and 366 yards. Rodgers had a hard task in replacing Packers legend Brett Favre, but the 27-year-old has excelled and become the first starting quarterback to throw over 4,000 yards in both of his first two seasons. 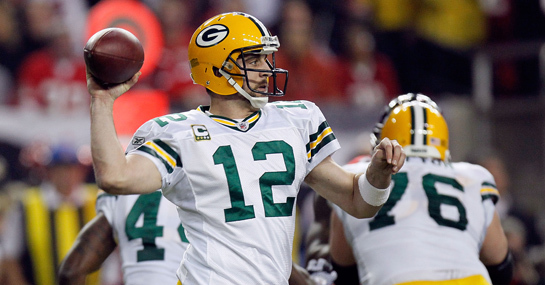 Backing the Packers to come out on top in this clash at 1/2 looks to be well worth a bet – especially if you take advantage of a free bet worth £25 with Ladbrokes. The Packers won’t have things all their own way though. The Bears quarterback Jay Cutler has found some form in recent weeks and their defense was able to reduce Rodgers to just two touchdown passes in their two meetings this season. These two sides have a bitter rivalry but are meeting in the playoffs for only the second time ever – the first being in 1941. With a place in the Super Bowl up for grabs this promises to be a thrilling, but tight encounter. So a bet on under 43 points to be scored in total at 10/11 looks to be well worth backing. A £25 stake on the Bears to win would pay out £68. New customers can sign up here for a free £25 bet.